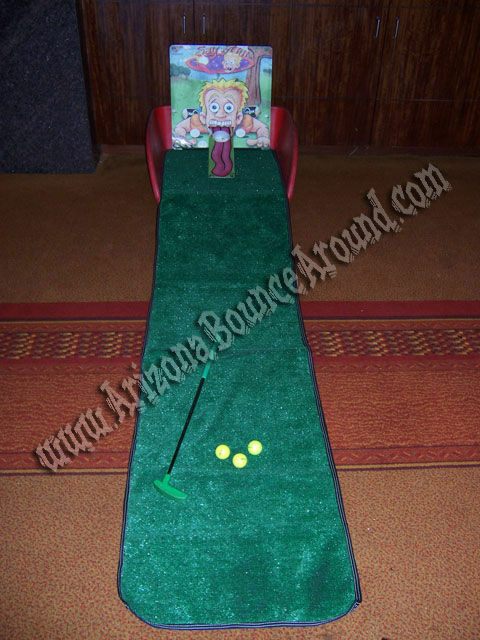 Our floor standing Say Ah mini golf putting carnival game is a true carnival game classic and the perfect game for school carnivals, golf parties or sports themed birthday parties. This game is really challanging because you must put the ball up the ramp into the guys mouth so this game could really be a challange between coworkers or friends. You can use this game to claim bigger prizes because it's a bit more difficult to get the ball in the hole. Our Say Ah carnival game rental comes complete with 3 golf balls and safety putter and sits on the ground for use. Remember it's a carnival game so it always has tricks to make it harder to win.